A Simple + Natural Life: flatbread pizzas! 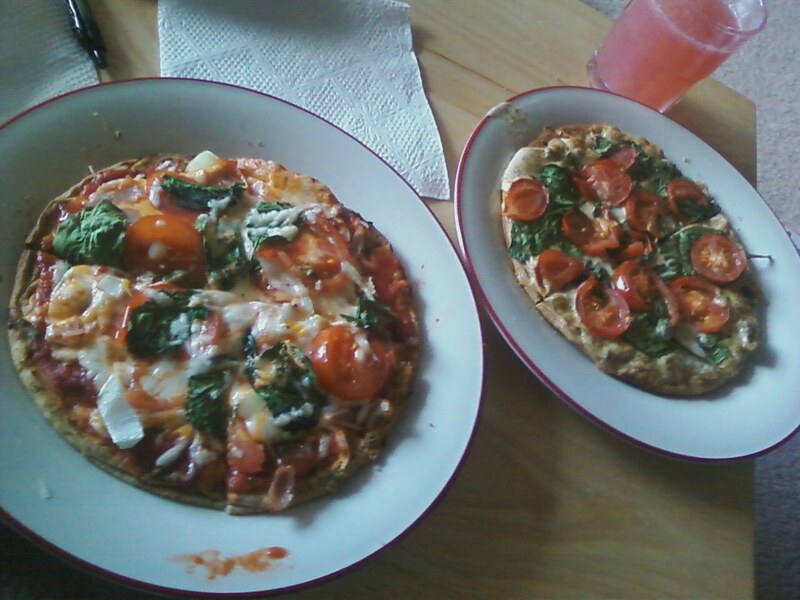 The other day I made Marshall & I made some pizzas...they were AMAZING. I found flatbread at the Commissary so I decided to give it a go. Basically, it's really simple. For my pizza, I put on some alfredo and pesto, then added the toppings: spinach, mushroom and tomato slices. Pretty simple. Marshall's on the other hand isn't so. His pizza has regular sauce, mushrooms, onions, spinach, tomato, shredded cheese, and perhaps a few other things I missed. I was going to add pepperoni but sadly they were moldy...I really need to stop putting food in the back of the fridge where I never see it!! I am getting much better at grocery shopping, and this can be evidence of that. Who ever would have thought that me, myself, and I would decide to MAKE pizzas on flatbread?!! Anyway, if you decide you want some, very simple to make. Also, once I finished putting all the ingredients on, I just slipped them into the toaster oven for maybe 5 minutes, or until the edges were brown and crispy. Since the flatbread was already made, it was SO SIMPLE! And don't these look delicious? !